Lighting in a bathroom can completely transform the look and feel of the room, by use of subtle lighting, it is possible to enhance the decor and by utilising strategically placed mirrors, a small bathroom can be made to look larger. Of course it is not just about the ambience of a bathroom, lighting is essential when it is dark, but also it can help with makeup and shaving even in daylight conditions. Modern lighting is a million miles away from the old 60 watt bulb hanging down from the centre of the ceiling; in fact this could often cause unpleasant shadows in the room. Spotlights placed in the ceiling using modern technology can be very eco-friendly and they will soon save the initial outlay by savings in electricity. 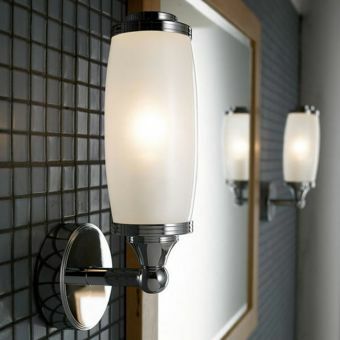 Wall lighting is very much to the forefront in a modern bathroom setting and it does not have to be contemporary either. 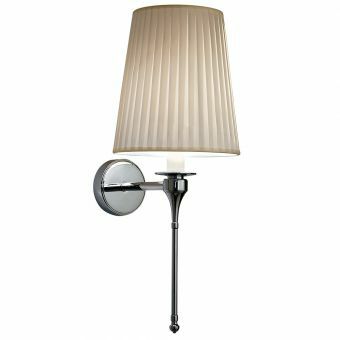 One fine example of an Edwardian style wall light is the double elliptical wall light from Burlington; you can almost imagine yourself in a swish London hotel in the twenties! Motion sensor lighting is the perfect answer to using the bathroom or toilet in the hours of darkness, one example proving extremely popular is the Unique Lighting Motion Sensor three light pack that will be easy on the pocket too as this uses just four AA alkaline batteries which have an average life span of a year, perfect for hallways as well as bathrooms. 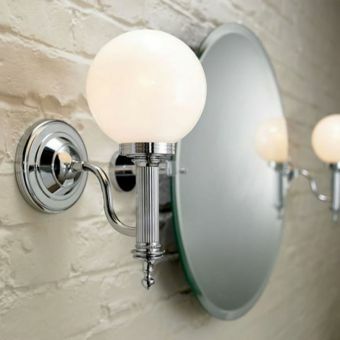 The type of lighting you choose could completely transform the look of your bathroom. Whether you want it to look larger and brighter or warmer and cosier, some careful lighting can help you achieve the bathroom you have been dreaming of. With so much choice available and so many different types of lighting to choose from, it can be difficult to know where to start. We have put together our ultimate buyers guide to bathroom lighting to help make your decision that little bit easier. The most important thing is to start thinking about whether you want to focus on task or decorative lighting first - or both! 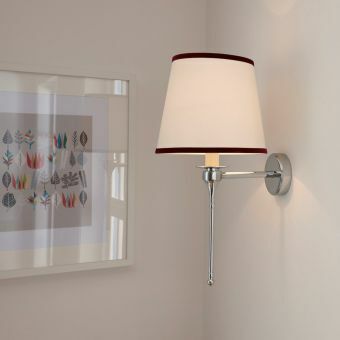 Task lighting is essentially functional lighting that helps make using the bathroom, one of the busiest rooms in the house, that little bit simpler. It is less about ambience and aesthetics and instead more about the all important job of making sure you can actually see yourself! Well placed task lighting makes things like applying makeup and shaving so much easier, especially early on winter mornings when the natural light is somewhat lacking. 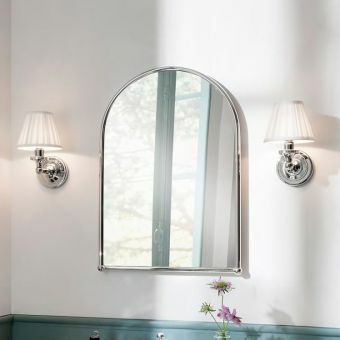 There are lots of simple hints and tricks when it comes to task lighting, such as not placing a light right above your mirror as this will cause long shadows over your face. Whereas task lighting works to ensure you can make yourself look fantastic, decorative lighting is all about making your bathroom look beautiful! This is where you can really paint your identity on the room and there are so many creative lighting solutions out there, depending on the size of your space. Perhaps you like the idea of a chandelier to light your evening bath or what about an LED lit whirlpool tub? There are a few things you need to think about in terms of safety and electrics which differ in your bathroom from elsewhere in the house. Most significantly, you are not allowed to have a wall mounted switch in your bathroom. This means that if you are considering having dimmer lighting you will need to have the dimmer switch mounted on the wall outside of the bathroom. Dimmer lighting can be a great feature and offer fantastic flexibility with regards to mood and ambience so don't let this put you off, it is just something to be aware of. 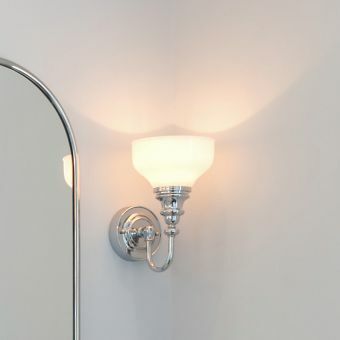 If you aren't interested in dimmer lighting, you can have a pull cord light switch inside the bathroom for convenience, instead of having an outside switch. The other main thing to consider in terms of safety is the IP (Ingress Protection) rating of any light fitting. This refers to the amount of protection said fitting has against water or steam entering the fitting. Each area of the bathroom is then allocated a zone, the details of which we have included just below. These zones depend on the amount of water a fitting in that zone is likely to come into contact with. There are then regulations which determine which IP rating a light fitting must have in order to be safely used in said zone. IP zone areas range from zone 0, which is inside the shower cubicle or bath (rated IPx7), to zone 1, which is the area that is directly above up to 2.25 metres (IPx4), and finally zone 2, which is both the area immediately next to, around, and above - to a height of 2.25 metres - zone 1, and additionally the areas around the wash basin (IPx4). A minimum of IPx5 is rated for zones 1 and 2 where water jets are used for cleaning. There are a huge number of different styles of bathroom light, but we are going to hopefully help you narrow down the selection process by talking you through a few of our favourite brands, as well as some ideas for how to incorporate them into your new bathroom design. 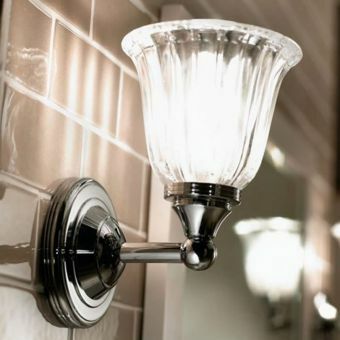 Wall lighting is one of our favourite ways to light up your bathroom because it is a brilliant way to incorporate task and decorative lighting to create a special look. As we mentioned above, overhead lighting can cause problems in your bathroom due to the shadows it casts which make it difficult to really see what you're doing, especially when shaving or applying makeup. 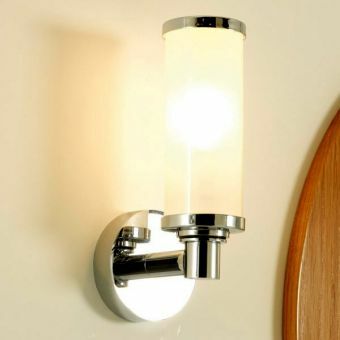 In contrast, wall lighting can be strategically placed around the bathroom to ensure the room is well lit but without creating unsightly shadows. Frosted glass is a great option. These shades are a fantastic source of light and entirely hide the bulbs, making the light appear almost ethereal. 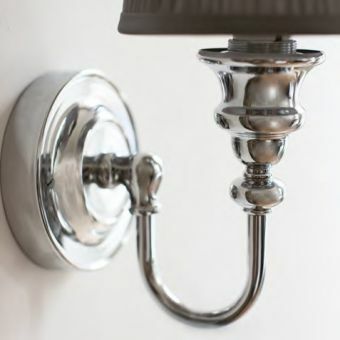 This Edwardian Single Round Wall Light would go with almost any bathroom or for something a little different you could try the teardrop shaped version, also by Burlington. The Burlington models mentioned above both have very little in the way of detailing but there are lots of alternatives if you love the frosted glass look but want something a little more eye catching too. If you still want something fairly simple, Imperial offers two good options. The Toledo and Carlyon are both more column shaped and are capped with metal detailing top and bottom. These would look fantastic to frame either side of a mirror. 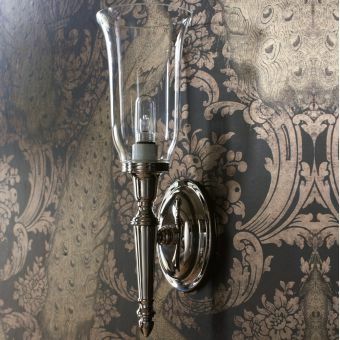 If you want even more, try the elegant Cadiz fitting also by Imperial, which features a subtle candelabra-esque base. 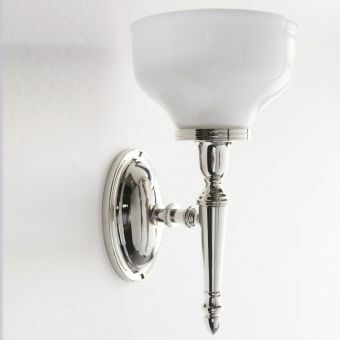 You might also want to take a look at the Burlington Frosted Cup Bathroom Light. For something entirely different, Keuco offers their unique wall light. The wall attachment here sits in the centre of the piece, with light cylinders either end. This makes it a very different shape to more traditional lights and means that it looks almost like a design feature in its own right - which is exactly how it is intended to look! The opal glass is more opaque than the models above, creating a lovely glow. 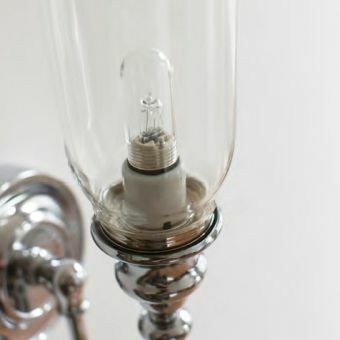 Clear glass fittings, where the bulb is visible, can often work very well too. 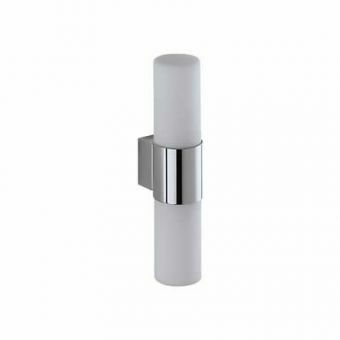 They often create a softer light and warmer atmosphere, compared to the cooler look of the frosted glass fittings. Imperial have some beautiful designs if this is the kind of things you are after. The open cup Avila fitting calls for a singular cylinder bulb. 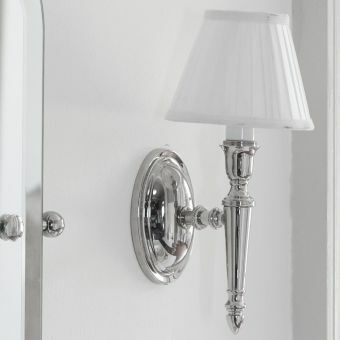 The width difference between the holder and the bulb creates an interesting look which could really lift the room and would look particularly special either side of a feature mirror. The Imperial Segovia has a corrugated glass look and tapers upwards, which directs the light upwards towards the ceiling and creates a feeling of spaciousness. 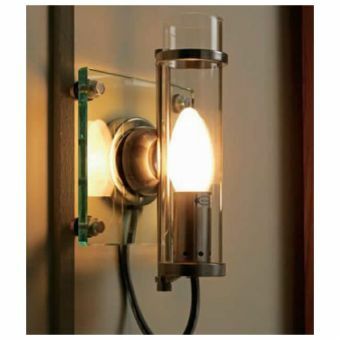 For an even warmer look, you could try the Imperial Tube Wall Light. This classy design would work well with a golden bulb and would be perfect for those sensual bath times. Don't worry if the minimalist glass look isn't for you; you can still experience the gorgeous glow of wall lighting by taking a look at our fabric shade options. 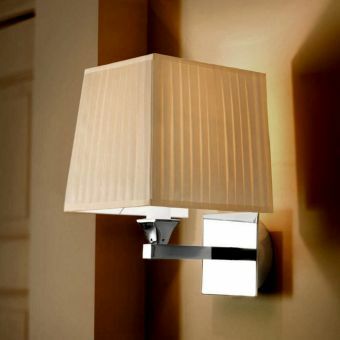 We particularly love the Imperial Astoria Wall Lamp. 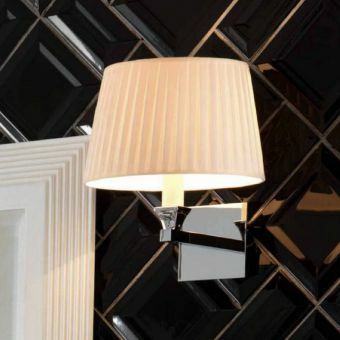 It looks great against sleek black tiles, as pictured, but the cream colour means this wall lamp would go with almost any décor scheme. 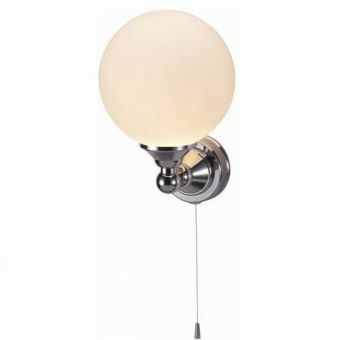 The Imperial Pendant is another good choice for a cream light fitting. 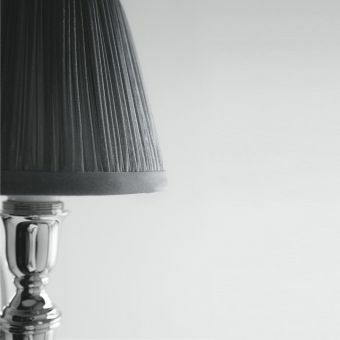 For a slightly more decadent look, you can't go wrong with the Burlington Chiffon Silver Pleated Lamp. 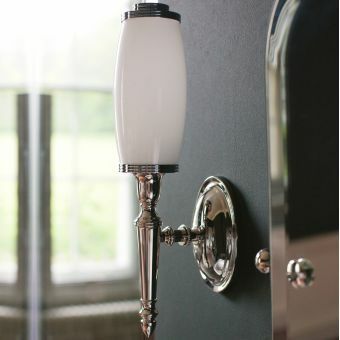 Several of these would look fantastic dotted around a larger bathroom or could frame a mirror nicely too. Another idea for larger rooms is the square shaped Imperial Astoria. We discussed task lighting before and it perhaps doesn't come any more clearcut than the HIB Shavolight Bathroom Light. This is a stylish yet practical choice that will give you the perfect shave. The sliding chrome cover cleverly hides the shaver socket, giving you both the look you want and the convenience you need. 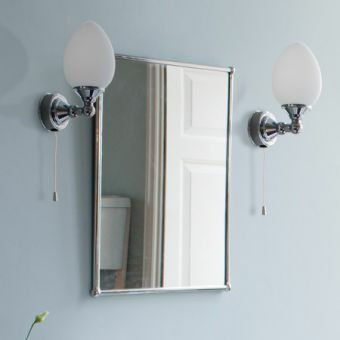 The white and silver chrome finish means that this light will go well with almost any bathroom and you can position it either horizontally or vertically next to your mirror. An illuminated mirror not only saves space, as the light is built into the mirror fixture but is also good for task lighting. It creates the perfect space, especially for applying makeup. Spotlights offer a particularly discreet lighting system and with several scattered across the ceiling, can give a less harsh effect than a single overhead strip light. One of the more unusual forms of bathroom lighting, LED floor lights can create a real ambience. 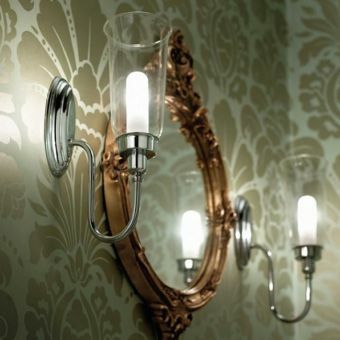 These are often effective in conjunction with some carefully placed wall lamps or perhaps a lit mirror.